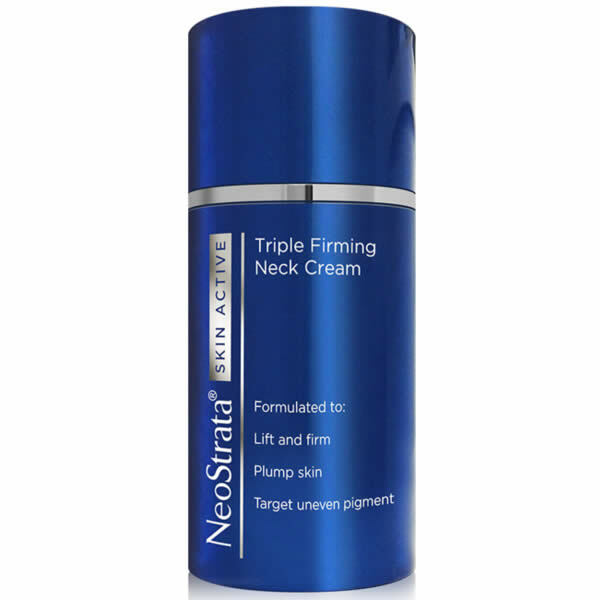 Neostrata Skin Active Firming Neck and Chest is an anti-aging neck and chest formulated with a triple technology, scientifically proven, to rebuild the dermal matrix cream. Each of these technologies provides a unique activity to firm the skin. The Pro-amino acids stimulate the production of pro-collagen and matrix constructed NeoGlucosamine hyaluronic acid that supports it. This trio of art assets, work together to densify and reaffirm the thin and fragile skin of the neck and chest. INDICATIONS - external use. - Avoid contact with eyes, if this occurs, rinse thoroughly. - In case of irritation the application should be discontinued. -. Keep out of reach of children USE Apply to clean skin of neck and décolleté two times a day. Achat Online Neostrata Skin Active Triple Firming Neck Cream 80g au meilleur prix. Une dermatologue m'a recommandé cette crème pour le cou. Elle est très agréable, immédiatement dès qu'on l'applique sur la peau. J'ai vraiment hate de voir ce que ça va donner par la suite. Je la recommande.